This sleek, classic, pencil-style skirt has an ingenious waistband that eliminates bulk around the waist. 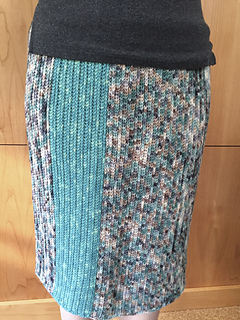 The stitch pattern gives the skirt just the right amount of stretch so it skims the body. Two color variations are shown but the simple construction and stitch pattern invites creativity. 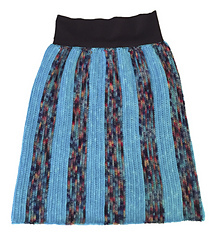 Make this skirt your own with your choice of color and pattern. Designer Candace Eisner Strick has developed an innovative method for finishing the waistbands of knit skirts that avoids the usual bulkiness that knit garments can have. She spells it out in detail in her book, Knit My Skirt, published by XRX books in 2016. 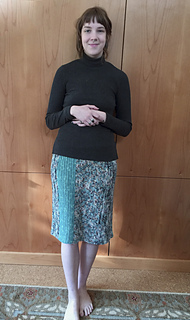 In addition, she has a video on YouTube “Perfect Waistband for Strick-ly Skirts Collection”, (Strickwear Channel) that also explains her method of finishing the waistband of a knit skirt. 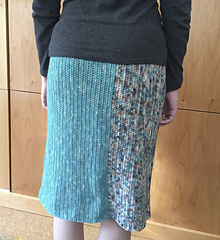 With her permission, I adapted the method for this crochet skirt. You will need a pair of tights in your size to complete the skirt.